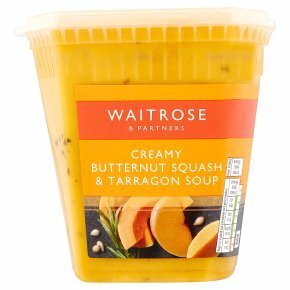 A sweet soup with butternut squash, cream and tarragon. INGREDIENTS: water, butternut squash (28%), carrot, onion, single cream (milk) (6%), potato, butter (milk), ginger purée, sugar, cornflour, garlic purée, salt, concentrated lemon juice, tarragon. Time: 5-6 mins. CHILLED. GENTLE HEAT. Empty contents into a pan. Heat gently, stirring occasionally, until piping hot. Stir before serving. Do not reheat once cooled.